The Florida Keys are attracting more and tourists year after year, as this is one place that really has a little bit of everything for everyone. The Keys can be considered the equivalent of the Caribbean such is the spectacular amount of beaches, water sports, fishing, diving and the kind of stuff like bars and restaurants that you want on your vacation available to you. And that is where your decisions need to to start. Each of the islands (and believe me there are a lot of them...over 1700 to be exact) that make up "Fla Keys" as we sometimes call them, have their own distinctive vibe that sets them apart from the others. Many of them are nature reserves, totally untouched by the Conchs, who live in the Florida Keys. Actually only 30 of the islands have people living on them, so with that absence of crowds it really gives you a chance to live a life free from everyday distractions. So now your here on the number one Florida Keys site on the web, just sit back a moment close your eyes, and start thinking about what type of Florida Keys vacation you really fancy. Because, with a splash of adventurousness and a drop of open mindedness, you can make a trip to the Keys that is simply amazing. Let's start with the furthest point south that you can go to...Key West. If you want to experience a night-life to die for, bars, clubs and restaurants that barely ever close, and of course fun or even historical tourist attractions then the island of Key West is the place to head for. Check Out The Best That Key West Has To Offer! The southernmost point of America, has more bars per capita than anywhere else on earth....ok that maybe stretching it a bit, but Key West can certainly claim this grand statement as in regards to the USA. It's a deliciously, mad and bohemian environment of artists, writers, dancers, restauranteers and other wildly creative and flamboyant folk. You want to feel a cool breeze blow across you as you sit and sip a delicious and refreshing Rum Runner Cocktail, whilst you watch the world enjoy the weather that you will only get, being as close you can get to the tropics whilst still staying in America, then your decision has been made.....first stop the island of Key West. But then again if you went straight to Key West you would miss out on Key Largo, the first of the islands that you will come to as you travel across the map of the Keys. And if you miss Key Largo then you will have missed the chance of enjoying the best diving that you will ever have the chance to experience. 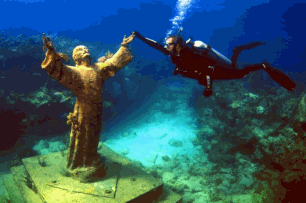 Key Largo isn't known as the "Diving Capital Of The World" for no reason at all, you know!! With John Pennekamp State Park on your doorstep, which happens to be the first underwater national park in America, you have got no excuse to join up with one of the many companies that will take you out to the area, so you can slip your flippers on and disappear into a magical world that you will never forget. But that would mean that you are missing out Islamorada which doesn't want to miss the chance of giving itself a big name like the others. And it does this with the name "Sport Fishing Capital Of The World"
With celebrities, presidents and anglers from across the globe descending on Islamorada to hit the waters to fish for Marlin, Tarpon, Dolphin and the greatest game-fish possible, just like Key Largo it lives up to its grand title big time! So that just leaves us with Marathon and Big Pine Key that are the natural areas of the Florida Keys and once again have a totally different feel to the rest. Marathon is known as the Heart Of The Florida Keys, whilst Big Pine Key is really unspoilt back to nature kind of place. You can enjoy kayaking, bird-watching, fishing and of course marvelous camping sites that will give you the best nights sleep you have ever had. My friends the choice is yours, and that is what makes the Florida Keys so special. "So what else does the Florida Keys have to offer?" Now you have read about the five main islands that make up the Florida Keys, you may have a better idea of what kind of vacation you wish to have. But lets give you more, and the only way that we like to do it is to give you the kind of more that wont cost a penny. You see many of the attractions or just delightful aspects of being in the here are that you can spend as much or as little as you like. 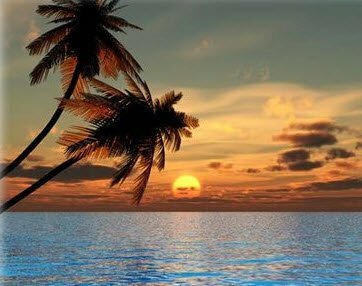 If you want something totally free, but unforgettable then simply start with the Florida Keys sunsets! Check out our page on Mallory Square - Home of The Sunset Celebration to see what all the fuss is about. We could start with the beautiful and sandy Keys Beaches that surround the islands. The beaches range from the small such as library beach in Islamorada, to the amazing Bahia Honda State Park. And this beach is recognized as the best beach in the whole of America. You can spend time with your dog on Florida Keys specially designed doggy beaches, or go to the ones that you can actually stay other night under canvas. Which brings us nicely to some RV Parks and campgrounds Florida Keys style. These give a low key, inexpensive but still wonderful way to see the Keys, as nature intended. And often you may get a visit from the magical Key Deer when you least expect it. Also we could throw in some top shopping at Duval Street(the Florida Keys Rodeo Drive...well almost). Add a splash of exotic and vibrant nightlife....at....Duval Street again!!! "Nah, that's not for us." So how about a wide range of premium accommodation. We have affordable hotels, villas and specialized boarding houses which can offer you the room, view, or even neighbours that you want to make your vacation unforgettable? Actually wherever you stay in the Keys and Key West will be a vacation to savour. Well,Fishing might be your thing. The islands offer the kind of world class sport fishing that would even stimulate the most anti-rod carrying tourist. How good would it be to surprise your loved one and tie the knot on one of our romantic hidden-away coves or beaches. Say "I Do" as the sun goes down behind you, casting dazzling flashes of light across the blue water, whilst the warm sea breezes blow gently around you. Just one thing and do us a favour. We do want to keep paradise for ourselves after all! !